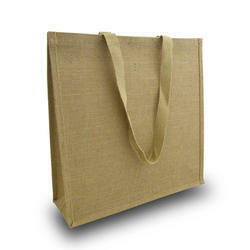 We supplied Jute Bags used for packing spices & rice. 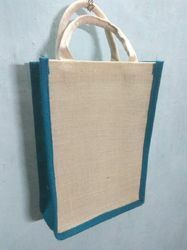 Size: 16" x 14" x 4"
Plain jute bag of natural color suits to all purpose and day to day work. With the years of experience and vast knowledge, we are involved in offering a quality range of Stitched Jute Bag. Acknowledged amongst our customers for their attractive designs, light weight, eco friendly nature and durable finish, these are highly demanded. Moreover our customers can avail them from us at budget friendly prices. With our industry experience, we are able to cater to the requirements of our clients in an optimal manner and offer them beautifully crafted Jute bags. These bags are suitable for casual use and can also be used as a formal accessory. We procure high grade jute form our vendors to enable a high durability in these bags which are available at the most reasonable prices. The Eco Friendly Tote Carry Bag is a 100% environmentally friendly bag that has a comfortable amount of space for all of your belongings. Made entirely from jute, a natural plant fiber, the Tote Carry Bag possesses strong straps also of woven jute, rugged and ready to take all that you can put in as you go grocery shopping. With the assistance of our diligent artisans and craftsmen, we are engaged in offering our clients with jute bags. Manufactured using quality fabric, these are available in different styles, sizes and cuts. Appreciated for being durable and handy, these can also be availed by our clients as per the specifications provided by them.